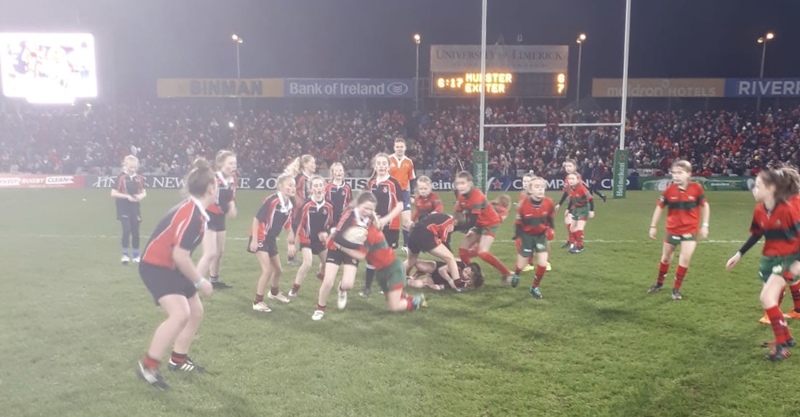 Last Saturday was a day that will go down in history for Killarney RFC as our U12’s girls took to the field at half time in the final pool game of the Heineken Cup. This match was a do or die for Munster Rugby as they hosted English Premiership table toppers Exeter Chiefs, in front of a sold out Thomond Park. With tickets sold out weeks in advance, the excitement was building ahead of the big game and nowhere more than at Killarney RFC. 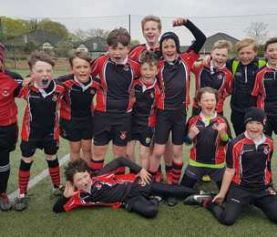 The girls were looking forward to hitting the road and as the bus pulled out from our pitch at Aghadoe at 1:30pm, the excitement was palpable with the girls and their parents, coaches and supporters. With a 5:30pm kick off, we landed in Limerick fine and early at around 3pm. The crowds were building and the music and buzz was electric all around the ground, especially outside the Dugout bar. The sizeable Exeter Chiefs support was pretty vocal and the away team proved they were there not just to make up the numbers. 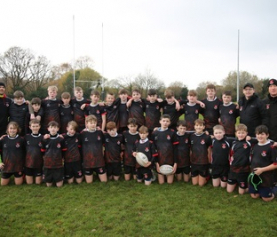 A tough match with few scores (6-7 at halftime) did little to dispel the nerves and with 30 minutes gone in the game the girls along with coaches Peter and Jenna made their way into their changing rooms meeting Munster player Dave O’Callaghan who posed for a few photos and also posed with the Munster Mascot – Oscar. 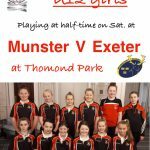 As the first half drew to a close, the girls lined up in the tunnel only to be sent on their way by Munster legend Dougie Howlett who wished both teams well. The girls ran out to the pitch alongside the girls from Clonakilty RFC, the opponents for the match. 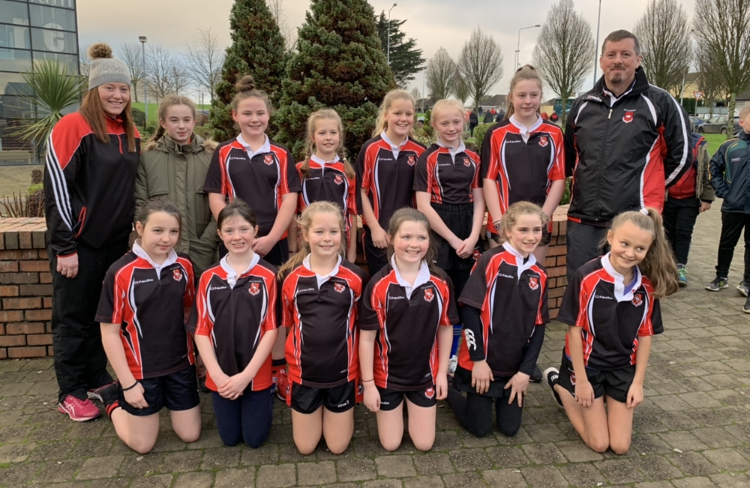 The girls did themselves so proud with some excellent passing, tackling, rucking and counter rucking on display, however it was the Cork side that ran in the first try. 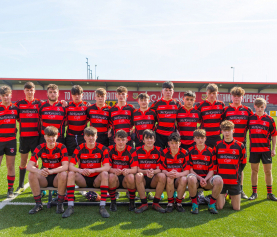 To the joy of the fans, the match was shown on the big screens at the ground and also on TV where the cameras managed to catch Ella Guerin-Crowley going over the line to score Killarney’s try – the first ever try to be scored by a Killarney RFC girl at Thomond Park. The try following on from a wonderful team effort from our own line. As Ella went over, you could hear the crowd applaud and cheer the girls on. Then as fast as the game started, it was over. The girls ran back to the dressing room buzzing from the match. The whole club is so proud of the girls and the coaches who have worked so hard with the girls. This is a day that will last in their memories for ever! Following the game, we headed to the South Court Hotel for a well-deserved dinner and presented each girl with a certificate in recognition of the big occasion as well as a program from the big game. It was lovely to see the girls signing each other’s match program, a wonderful momento from the day. With the food deservedly enjoyed, we hit the road and returned to Aghadoe tired, but delighted with the day at around 12:15am. What a fantastic day for all involved and a huge thanks must go to everyone involved. First off to the coaches on the day Peter and Jenna and the hard working coaches who have coached the girls this season. Saturday was a result of years of worked kicked off by Liam Murphy and Denis Corridan encouraging girls rugby in Killarney and a huge thanks must go to our Female Liason Officer Denise Treacy for all the hard work in organising the day. Thanks to the sponsor who looked after the girls on the day, very much appreciated! Thanks to the supporters, family members and the ‘fanclub’ who cheered on the girls on the day. Thanks to the hard work of many, our girls section continues to flourish with Killarney RFC girls playing with Kerry U14’s and others training at U6 right up to U10.